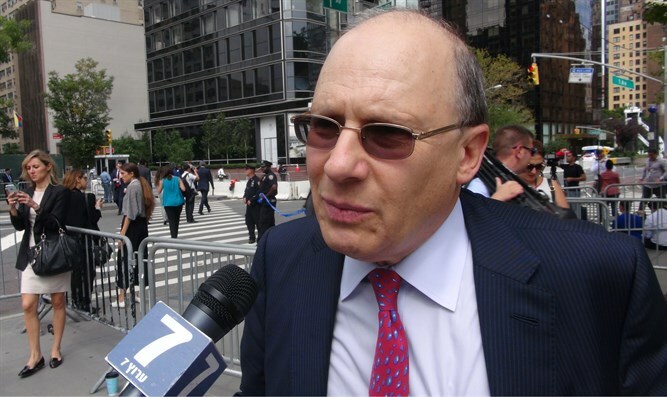 American Friends of Likud Chairman and SaveTheWest founder Ken Abramowitz spoke to Arutz Sheva about the relationship between events in Gaza, Syria, and Iran. "Every issue is interrelated with every issue. So Gaza is really not an attack from Gaza, and not an attack from Hamas, and not an attack from Islamic Jihad; it's an attack from Iran. Iran is calling the shots, Iran decided to attack Israel from Gaza, and Israel's attacking Iran in Syria. So Iran probably figured, 'Let's have Israel busy in Gaza so they cannot blow us up in Syria. "Remember everything's interrelated with everything. So the problem is Iran has promised to kill everyone in Israel - by the way, they've also promised to kill everyone in America - and they're determined to take over the world. "So all of these battles will not end until Iran is destroyed. I think within one or two years Iran will be destroyed." Asked about Anthony Scaramucci's earlier remark that he believes in a one-state-solution, Abramowitz said, "I would agree with him; I'm a fan of what I call 'status quo plus'. I think the status quo is basically the best Israel can do, but I added a plus, because Israel can do a little bit better. For example Israel should annex Area C which is 50% of Judea and Samaria; that would be obvious. Right now Area C is being invaded by Bedouins paid for by the EU and the Moslem Brotherhood. Israel has to stop this invasion and take control over Area C. That's the minimum we should do." What's next after Abbas? "When you're dealing with terror organizations, the answer's always 'no'. You can say whatever you want to say and negotiate with whoever you want to negotiate with, the answer's always 'no'. So it does not matter who replaces Mahmoud Abbas, the answer's 'no'. And after him, the answer's 'no'. So therefore Israel just has to do what's in its self-interest, and as soon as it realizes what is in its self-interest, it should just say 'yes' to itself and do it, but never hold out any hope that the other side will agree to anything that Israel wants to do." Asked about American news coverage of Gaza, Abramowitz said, "The news organizations do not understand Gaza for two reasons; one is, they do not understand Gaza, and the second is that if they understood Gaza, and they understood that Hamas is a terror organization and Islamic Jihad's a terror organization financed by the Iran terror organization, and they talked about the terror organizations, they're dead. So when journalists get dead, so to speak, if they tell the truth, you can see why they basically lie because they have to lie in order to save themselves."